A romantic musical / comedy that humorously explores the late 1920's movie studio system, and how the "Talkies" shook up the status quo. Perfectly directed by: Gene Kelly. 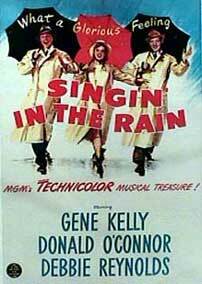 The cast includes: Gene Kelly, Debbie Reynolds, Donald O'Connor; with Jean Hagen, Cyd Charisse, and Rita Moreno.